Saturday, 12/22 -> So What! 25th Anniversary Party w/DJ K-Nee, DJ Low Key & special guests at Taxi!!! Come celebrate an extra special anniversary of Denver’s longest running party! Sunday, 7/29 at 11am -> So What! 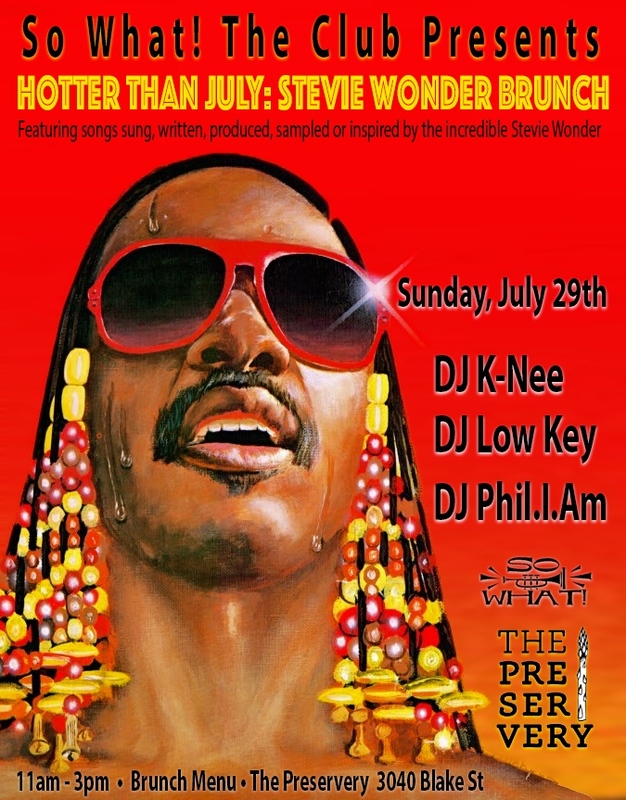 presents Hotter Than July: Stevie Wonder Brunch at The Preservery!!! 4 hours of Stevie music, remixes, covers, production & more w/DJ K-Nee, DJ Low Key & special guest DJ Phil.I.Am! 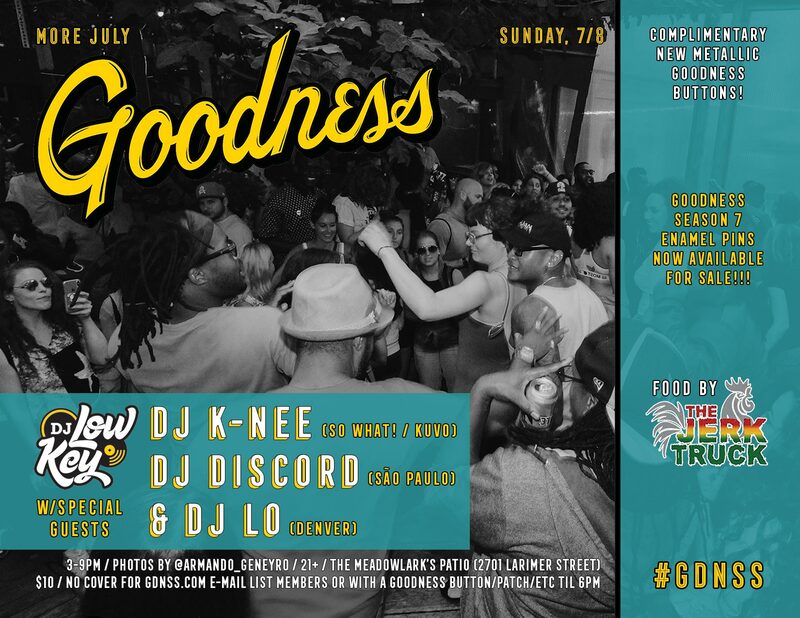 Sunday, 7/8 at 3pm -> More July Goodness w/DJ Low Key and special guests DJ K-Nee, DJ Discord & DJ Lo! Complimentary new metallic #GDNSS buttons, food by The Jerk Truck, photos by IG: @Armando_Geneyro & lots more on The Meadowlark’s magical patio! 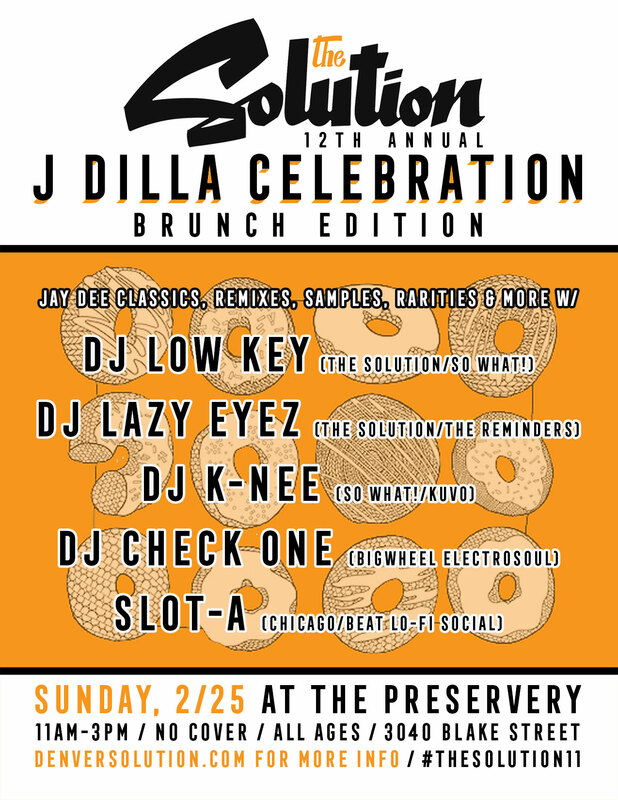 Sunday, 2/25 at 11am -> The Solution’s 12th Annual J Dilla Celebration: Brunch Edition w/DJ Low Key, DJ Lazy Eyez, DJ K-Nee, DJ Check One & Slot-A (Chicago) at The Preservery!!! Bottomless mimosas, 4 hours of Jay Dee classics, remixes, samples, rarities & lots more! Tuesday, 2/13 -> So What! 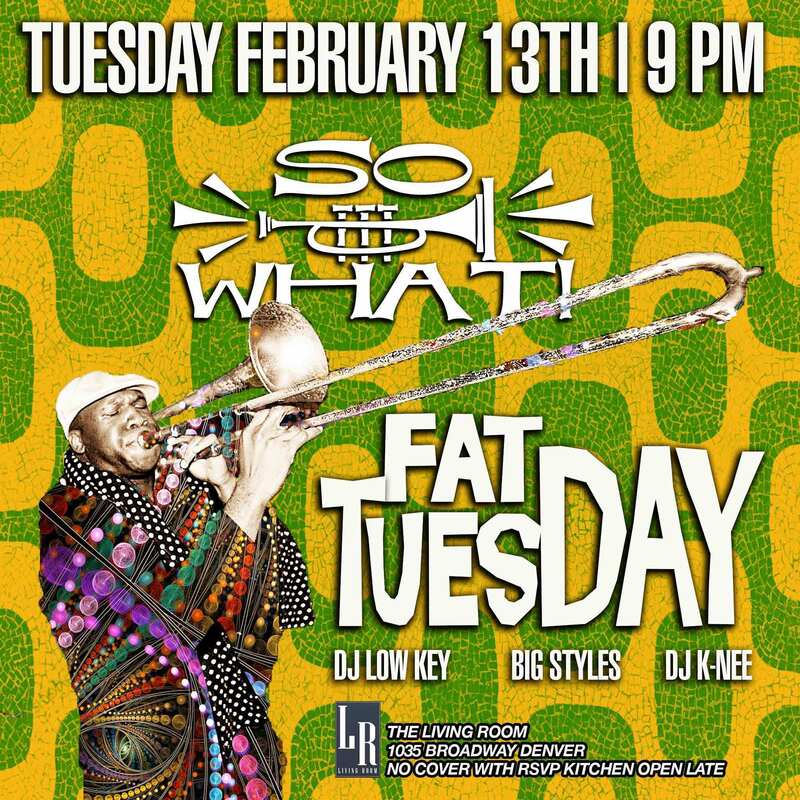 Fat Tuesday w/DJ K-Nee, DJ Big Styles & DJ Low Key! Denver’s Funkiest Dance Party returns on Fat Tuesday with the sounds of New Orleans, Brazil & lots more at The Living Room. No cover when you RSVP HERE. 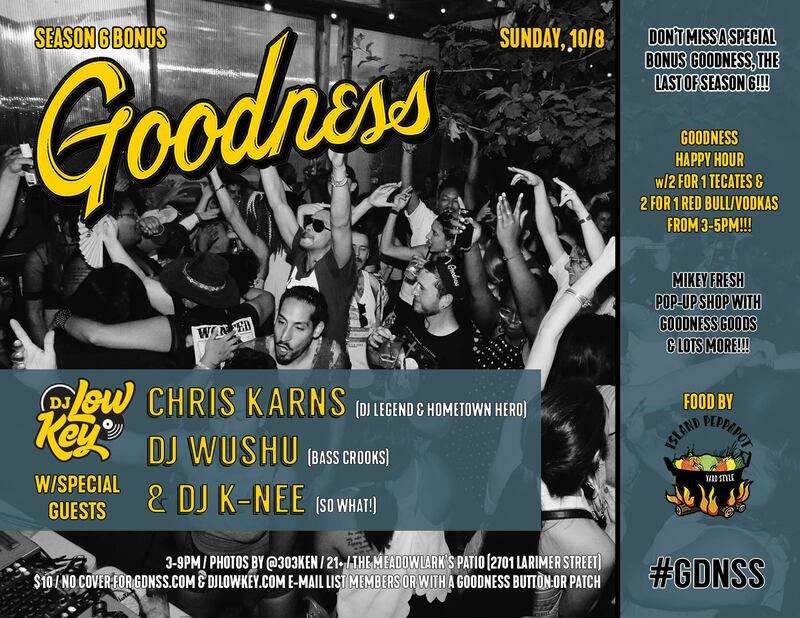 Sunday, 10/8 at 3pm -> Bonus Goodness w/DJ Low Key and special guests, world renowned DJ Chris Karns, DJ Wushu & DJ K-Nee! Food by Island Peppapot, #GDNSS happy hour from 3-5pm, Mikey Fresh Pop-up Shop, photos by IG: @303Ken & lots more at The Meadowlark!!! P.S. This Bonus Goodness is the last Sunday of #GDNSS Season 6 to hit Denver – don’t miss it!!! 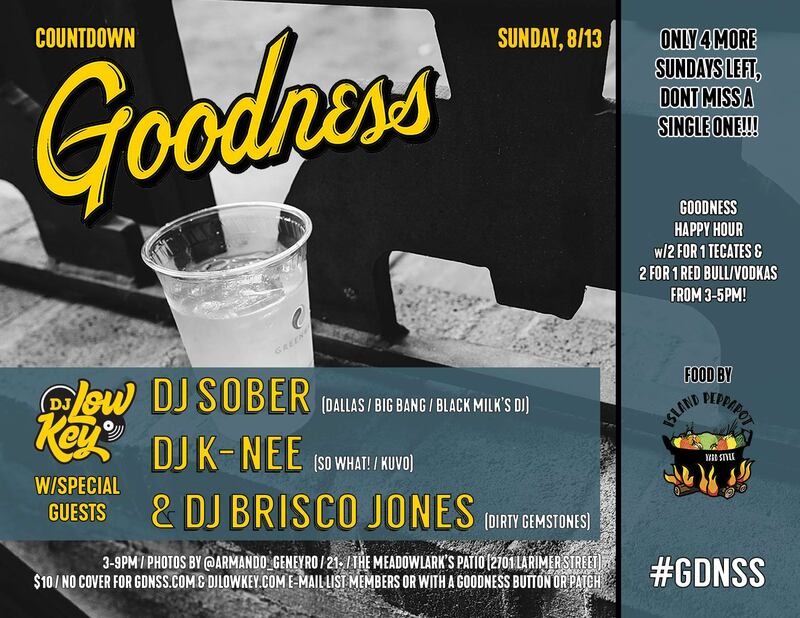 Sunday, 8/13 at 3pm -> Countdown Goodness w/DJ Low Key and special guests DJ Sober (Dallas), DJ K-Nee & Brisco Jones! Food by Island Peppapot, #GDNSS happy hour from 3-5pm, photos by IG: @Armando_Geneyro & lots more at The Meadowlark!!! P.S. Only 4 Sundays of #GDNSS left on the calendar, don’t miss a single one!! !